All she needs is someone to prove her wrong. Laurel’s life bears no resemblance to the love stories she writes. While handsome heroes are easy to imagine, they’re much more difficult to find. Years of bad dates with creepy men have left her feeling cynical toward all things related to love. When she and her best friend find themselves caught up in Morna’s meddling magic and are transported to seventeenth century Scotland, Laurel meets a man who threatens to change her attitude toward matters of the heart. After two years away, Raudrich returns to his home on The Isle of Eight Lairds to resume the duty he’s pledged his life to. When he arrives, he finds an out-of-time lassie asleep in his bed. The woman intrigues him, and it doesn’t take long before she captures his heart. But something inside causes her to resist her feelings. If only he could help her love herself, perhaps she would have room in her heart to love him in return. As their feelings grow, so does the strength of an evil held captive beneath the castle—an evil that will do anything to escape. Will Laurel open herself up to the possibility of love? If she does, can she find the power within herself to outwit the evil she’s destined to face? I love, love, love this book. This book is a bit different than the others in the series and it is fantastic. The romance, the characters, the magic all make for a terrific story. This book more than any other has left my mind whirling with whose story will be coming, there are so many possibilities! I'm not sure I will be able to wait!! 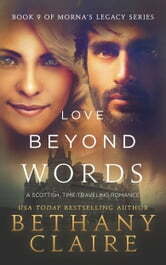 As usual with this series, Love Beyond Words is a great addition to the existing books but can easily be followed without having read the other books. Although as a fan of Bethany and the series, I highly recommend reading them all if you haven't already. I am a huge Bethany Claire fan and have read all of her books. I eagerly wait the release of each book. This one was a surprise, in a good way. It has a bit of a twist and a little more magic and intrigue mixed in with the love story. Bethany does an excellent job of setting it up for many more books to come featuring these characters and I for one cannot wait for it. If you love old legend, the Fae, a love story. and strong characters get this book. OMG this is Bethany Claire at her best! I've been a Bethany Claire fan for two years now. I've read all of her books...the original series, the 'sweet' version of the original series and I've listened to the available audio books. Love Beyond Words is my new favorite. There's some old characters, lots of new characters....some old magic...some new magic...and a touch of well done supernatural. This new book opens the doors for so many new stories. I'm excited for what's to come. By Bethany Claire (Morna's Legacy Series Book 9) Laurel's life is nothing like the love stories that she writes. Years of bad dates with some really creepy men have left her feeling somewhat cynical towards all things related to love. Maybe she doesn't even believe in love anymore. When she and her best friend Marcus find themselves caught up in Morna's meddling magic and are transported to seventeenth century Scotland (against their will), Laurel meets a man who is everything she has ever wanted, but can she get past her feelings to give him a chance? After two years away, Raudrich returns to his home on The Isle of Eight Laird's to resume the duty he's pledged his life to. When he arrives in the middle of the night, he finds an out-of- time lassie asleep in his bed. The woman intrigues him, and it doesn't take long before he falls deeply in love with her. But something inside her causes her to resist his feelings. If he could only just find a way to get her to love herself, perhaps then she will have room in her heart to love him back. As their feelings grow, so does the strength of an evil fea held captive beneath the castle in the dungeon. An evil that will do anything and make any deal just to escape. Can Laurel open herself up to the possibility of true love? And if she does, can she find the power with in herself to outwit the evil that she is destined to face? Bethany Claire is utterly amazing. She is the Queen of time travel. I believe that this is the best book she has written yet. I couldn't put it down it was captivating from the moment I started it until the moment I finished it.